In this category there are available the most advanced machinery for the treatment of obstructive/central sleep apnea. The CPAP ventilators fixed inspiratory pressure, the value of which must be established by a prior examination (polysomnography). The Auto CPAP (abbreviated APAP) are pressure fans inspiratory self-adapting able to vary the flow of air by using the patient's condition. The BiLevel (abbreviated with BiPAP) ventilators are double flow (inspiratory and expiratory) indicated for patients who have problems also in the expiration phase (overweight patients). You should choose the device on a prescription issued by your sleep center. The normally humidifier must be purchased separately, unless the product does not already include in price. 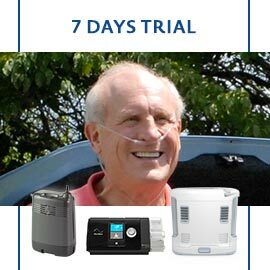 Humidifiers for CPAP, Auto CPAP and BiLevel. Brands: Somnetics, Philips Respironics and ResMed. Filters for CPAP, Auto CPAP and BiLevel. Brands Somnetics, Philips Respironics and ResMed.